While Cornwall and Devon enjoy some of the mildest weather anywhere in the UK, summer-time still remains the peak time to visit. Cornwall experiences the mildest winters in Great Britain – rarely does it snow in winter and summer days tend to be wonderfully warm and sunny. In Cornwall, May is a very good time to visit, and all months up to July enjoy around seven hours of sunshine a day. 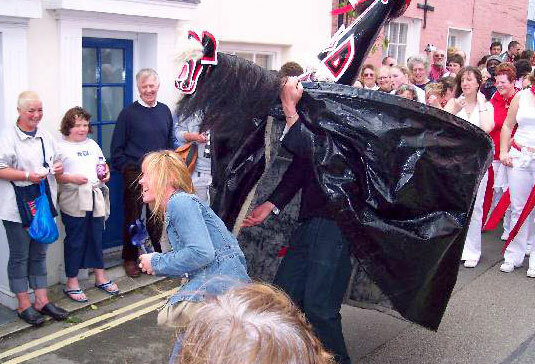 If you happen to visit Cornwall during May Day then a visit to Padstow is highly recommended to witness the all but mad event of Obby Oss. This strange ceremony is performed every year in order to “welcome summer” (something that perhaps the rest of Britain should consider). During this colourful and noisy procession, two large masks representing horses are paraded through the town accompanied by musicians playing the “Obby Oss May Song”.